Hurricane Sandy is being described as one of the worst - possibly the worst - in history for my area due to extreme flooding on the shoreline. Long Island Sound created a bottleneck effect for the storm surge, which was amplified by an unusually high full-moon driven high tide. My family lives in an area that borders a town on the coast and it was disconcerting to here that the neighboring town had mandatory evacuations - something that has never happened before in my memory. Nonetheless we made it through all right, with no damage on our property. Others in the state were not as lucky and my heart goes out to the families of those killed and to the people dealing with massive property damage. Before and during the bulk of the storm I prayed and did what I could both mundanely and magically to secure my property and protect my family. All day yesterday we watched the wind increase and waited for the storm to make land fall. The day took on an anxious energy of its own as we waited for something dramatic to happen, and nothing did. We did not lose power, and while our neighbors' weeping willow fell, nothing in our yard was damaged, beyond the usual leaves and small branches coming down. As darkness fell everything intensified, until around 9 o'clock last night, when it began to slowly lessen. With my children in bed I decided to hold a full moon ritual, using the energy of the moon and storm to bless several objects. I could have done this in several different Druidic or recon styles but instead I used ritual style that blends witchcraft and the fairy faith; I used to do things this way often a long time ago, but now I very rarely use this approach. Although I have not done things this way in a long time, it is more organic and less structured and somehow felt right under the circumstances. 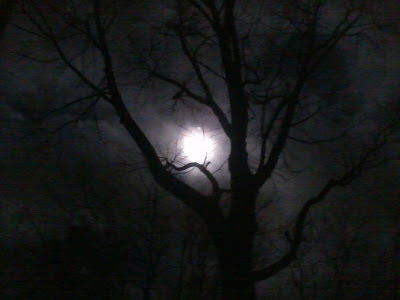 So I went out in the wind and rain and called on the Lord and Lady of the Greenwood, the people of the Sidhe, as well as the spirits of each direction, and my ancestors, and I focused the enrgy of the storm, of the moon, of the tide, to charge certain talismans. There was something primal and beautiful about it and at the height of everything the clouds cleared away from the face of the moon, which shone down more brightly than I have ever seen it. It was a transcendant experience that I cannot possibly put into words. I am glad I followed my heart and didn't force myself to use a more formal ritual structure. Well it looks like my area is going to get a late season hurricane, nicknamed "Frankenstorm". It seems appropriate now to post a prayer for protection. This is one of my own, based loosely on the style of the Carmina Gadelica. through the day and darkest night. oh, shield us and keep us from harm! and the ancestors watching over us. "Do réir a chéile a tógtar na caisleáin." I've been thinking a lot lately about what it means to me to be a Druid, a title that for me represents a bridge between the ancient and the new. How does it shape my life? How does it affect me? This may seem like a simple question, but I've struggled to grasp it now for a while. It's like asking how does being a woman shape my life; it influences so many aspects of my being that it is, in its own way, an intrinsic part of who I am. I tend to favor seeing the word Druid as a title, but in some vital ways it has ceased to have that meaning for me - or rather has gone beyond that - and become part of who I am. I am a Druid. If I never held another ritual, if I never taught another class, if I never sought imbas, if I ceased every action that defines the word Druid for me, I would still be a Druid because the external actions have become only a reflection of the inner process. I do not know when this happened, or how, but I know it is true. So, how do I feel that my life reflects my religious path and role? I feel a driving responsibility to help those that need help. I teach. I run rituals for the public when I can. I care for the world I live in so that it will continue to be able to support all of us by recycling and living as best I can with nature. I try to be knowledgeable so that I can answer questions when people need answers. I hone my skills, be they magical or mundane, so that I can use them when they are needed. I do my best to serve my community when and how I can. I pass on what I know to my children and my students. I strive, not to live in harmony, but to nurture that which creates the best outcome for myself, my family, and my community. I actively use what I know and what I can do, magically, when I think it needs to be used. I pray to the Gods and spirits, make offerings, and do everything I can to nurture a strong relationship with them. But do my actions make me a Druid? Being a Druid is judged by others based on external actions; either I fit that individual's perception of what a Druid is or I don't. My actions are judged as a if they were my beliefs, yet they are only a reflection of my beliefs. I do not live an honorable life because its what's expected or to fulfill a standard, I live an honorable life because I know that is the best way to live. I know that everything has a spirit and so I honor those spirits. I know the beauty and fierceness, power and vastness of the Gods, and so I honor them in word and deed. I know that my ancestors are with me still and so I talk to them and include them in my life. I know the might and mystery of the daoine sidhe and so I respect them. I know that energy is endless and so I have learned how to understand magic as a tool and use it when I need it. I know that all things are connected and how to read those connections under certain circumstances. I know the paths and ways of the Otherworld. I can read the sky where I live, and understand the trees and plants. I know that great wisdom lives in the old stories and folktales, myths and legends. I listen and hear the song of the aos sidhe, look and see the flow of energy, feel the potential of life. I know these things in my heart and my mind, and I live them in my spirit; my actions are a reflection of this knowing. That is what makes me a Druid. There was a point in my life when I acted like I thought a Druid should act because I thought that was what made someone a Druid. I understand now that acting like a Druid and being a Druid are wholly different things. One is based only on action. The other is rooted in the soul. In modern neopaganism and the new age movement using crystals and stones for healing is an almost ubiquitous practice. This can lead people who focus more on reconstruction to wonder what place this practice held, if any, with the ancients, in my case specifically the Irish and closely related Celtic cultures. When we look at the oldest sources, the accounts of the Greek and Roman writers all that is found is a reference to the fabled "Druid's Egg"*, an object that may or may not actually be a stone, said to be formed by the spit of snakes. On the otherhand when we look at slightly more recent folk practices from Ireland and Scotland we can find evidence of the use of stones and crystals for several purposes. Archeologists excavating Iron Age graves in England have found balls of "rock crystal" (clear quartz, I think) wrapped in bands of silver, or less often gold or bronze (Fraser Black, 1894). It is unknown what these were used for, whether they held a magical significance or were purely decorative, however similar balls of crystal were used in later periods in the belief that they could ensure victory in battle or bring healing. In Glenlyon there was such a wrapped crystal that was called either "Clach Bhaui" (powerful stone) or "Clach Buaidh" (victory stone); similarly another such stone is called the "Clach-na-Bratach" (stone of the standard) (Fraser Black, 1894). The Clach-na-Bratach belongs to Clan Donnachaidh; it was found by the clan chief in 1315 on the way to battle and was believed to be a good omen, as such it was consulted before every following battle and carried into the fray until 1715 when an internal flaw noted (Fraser Black, 1894). 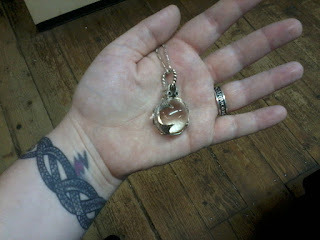 After it was retired from battle it was noted that this stone also had healing powers especially for catle. There is also a named stone in Scotland called the Clach Dearg (red stone) which is reputed to have the ability to charge water with healing power, following a certain ritual process (Fraser Black, 1894). Some say the Clach Dearg was originally part of the wand of an arch Druid, while others believe it was imported from the east (McNeill, 1956). In Keppoch the MacKenzies are said to possess a healing stone associated with the holy well of Brighid, which would be dipped into the water from the well for a healing charm (McNeill, 1956). The majority of these stones range in size from one inch across to an inch and a half, and most are mounted with silver bands. Thou yellow, beautiful gem of power! Which Bridget didn't permit to be contaminated. You beautiful gem of power! Both saints Columba and Fillan were said to possess "curing stones", all white, which could heal when dipped in water which was then consumed. Saint Molio also possessed such a healing stone, but that one was green and was rubbed on the afflicted area to effect a cure; interestingly this stone is also said to grant victory in battle and is alleged to have belonged to Clan McDonald. Many churches had healing stones on their altars, and some could be found next to holy wells; these might resemble the body part they were best used to heal, such as the eye or heart (McNeill, 1956). An deigh sin gun dad ach 'n larach." Less commonly curing stones might be used for other purposes. A type of curing stone was one used for curing infertility. One example from Scotland is an egg shaped quartz that was passed from one "wise woman" to another upon death, and was used by placing the stone in running water (preferrably south-flowing) in which the woman would then wash her feet (Fraser Black, 1894). Stones of rock crystal would also be drilled to create a hole and then worn to protect against the evil eye (McNeill, 1956). The famed stone of the Brahan Seer was a white stone with a hole in it, said to be a gift of the fairies, through which he could divine the future (McNeill, 1956). These stones are described as being worn and carried in the pocket, but may also recieve special care. One curing stone was said to be kept in a locked chest, wrapped in linen and then wool (Fraser Black, 1894). Another was said to be wrapped in cloth, kept in a silk bag, and wrapped in a napkin (Fraser Black, 1894). In many cases they were passed down in families as an heirloom, and if they were well known people might come from great distances away for the offered healing. *McNeill does reference "clach nathrach" (serpent stone) also called a Druidical bead said to be created in the same way, by snakes, but found in Scotland on the ground, possibly referring to a common type of stone of an unknown (to me) type. This stone was used to protect against enchantments, for healing, and for childbirth. I have always seen tattooing as a sacred process, a way to permanently embed images and symbols into the flesh that have a transcendent meaning. All of my tattoos contain this level of meaning and are first and foremost for me spiritual and secondarily art work. Even the proces of being tttooed has spiritual implications for me, and I have often approached the experience as an offering to the gods and spirits. There is, so far, no concrete evidence of the Celtic peoples using tattooing but there is evidence of tattooing in similar cultures, including the Picts which made me want to explore the concept of tattooing in the ancient world, specifically in Europe. The earliest know tattoo work found was on the so-called Ice Man, a preserved body found in the area between Italy and Austria. This body was dated to 3000 BCE, making it over 5000 years old(Lineberry, 2007). The body displayed tattooed patterns on the lower back, knee, and ankle which led researchers to conclude the tattoos were mostly therapeutic in nature, being placed on areas with signs of degeneration (Lineberry, 2007). From this it would seem that the earliest tattoos could have been used in a medicinal fashion, although exactly how can only be guessed at. Additionally tattooing was believed to have been used among the Scythians and Picts. Several preserved Scythian bodies have been found dating as far back as 2400 BCE and both the male and female bore tattoos, in some cases very elaborate, depicting animals and mythic images (Lineberry, 2007). In his writings Herodotus remarked that among the Scythians "tattoos were a mark of nobility, and not to have them was testimony of low birth.”. This could indicate that by the time Herodotus was writing - around 450 BCE - tattooing had become a sign of social standing. The stylized images seen in the Scythian tattoos are the same as those seen in other Scythain artwork, indicating that the tattoos reflected larger social concepts and symbolism (Kromarik, 2003). In the case of the Picts less is known with certainty because no preserved bodies have been found. Writings from secondary sources indicate that Pictish tattoos, like the Scythian, were a symbol of status and that they included images of animals (Lineberry, 2007). Herodian, writing around 200 CE says that the Celts 'draw figures of animals or symbols on their skin by pressing hot iron onto their limbs, causing great pain, and over this they rub the sap of a plant'. (Green, 2012). While this account is questionable because the writer never traveled to any of the Celtic lands and was likely repeating another person's experience there are other Roman sources that mention the use of iron implements to create permanent marks, which means it was either a widespread belief by the Romans or may have been the actual practice. As late as 600 CE a Christian bishop noted the practice of tattooing among the Picts, mentioning a process similar to that cited by Herodian, except pricking was used in place of hot iron (Green, 2012). Other cultures that used tattoos included the Egyptians, Nubians, and some areas of the Americas. Tattooing would later spread to the Greeks and Romans, initially as a way to mark a person as being dedicated to a temple or as a slave (Lineberry, 2007). However the advent of Christianity slowly discouraged the practice of tattooing which was seen as defiling the body, although it is seeing a modern resurgence. The true meaning behind ancient tattoos in many of these cultures will never be known, but we do know that tattooing was a common practice among some ancient cultures. The evidence also supports the theory that these tattoos, particularly among the Picts and Scythians, were more than mere decoration. Whether the Irish Celts tattooed or not we may never know. I am comfortable with my own view of the sacredness of tattooing and will undoubtedly continue to add spiritually meaningful tattoos to my own body. This month we are looking at the seventh rune of the first aett, called Gebo or Gifu. To someone familiar with the English alphabet it looks nearly identical to a capital letter X, but makes a hard “G” sound. Gebo is found in both the elder and younger Futhark. The first half refers to the honor earned by men who give generously, while the second part discusses how essential such giving is to those in need who have nothing. In this way we can see the core meaning of the rune established - the balance between giving and receiving which is essential to our ability to function and progress. This rune is associated by some with the Norse god Odin, goddess Gefjon, and the Vanir. It is represented by the heathen maxim “a gift for a gift”, and can symbolize reciprocity, an exchange, sharing, joining, and sometimes marriage or sexual union. Some runesters also interpret it to represent prosperity, abundance and good luck, although others see it as a rune of balance which may symbolize contracts and agreements. In the negative it can remind us that all things have a price and that we must give in order to receive. When Gebo appears in divination, depending on the surrounding runes it can represent a partnership of equals - if for example mannaz was nearby - or else the need to seek or be open to help or guidance - if Ansuz was next to it. It can also remind us to seek a balance of opposites and to review areas of our lives to be sure we are both giving and receiving in a healthy manner. It can sometimes appear simply as a sign of good luck and abundance. The message of Gebo always carries a reminder that giving and receiving creates an energetic bond between the two parties which inevitably effects both of them. In magic Gebo can be combined with other runes to good effect. To increase wealth draw Gebo and Fehu together on a green candle, or trace on a dollar and keep in your wallet. This combination can also be used to increase luck. For good luck draw three or nine Gebo runes in a row or grid pattern. To aid in spiritual enlightenment during ritual or meditation combine Gebo and Ansuz in a single bind rune and trace on your forehead, and to add speed to any spell trace three Gebo runes combined with three Ansuz runes onto the candle or charm. This is a fun rune to experiment with, and that can be a very effective way to get to know it’s energy. Try adding it to your spells, either as mentioned above, or in your own way, and observe the effects. One easy way to start is to draw it on a dollar bill, possibly with a good money drawing oil, and carry with you. It is also useful to meditate on the rune, visualizing I and seeing the rune’s shape growing larger and opening up until you move inside it’s shape. Spend time within the energy this way and allow the energy itself to shape the images you see. When you feel you are done see yourself moving out of the rune’s shape and watching it shrink back down. Write down your experiences in a journal. Next month we will look at Wunjo. My newest book - a children's book about the fairy faith and its modenr application for pagans - has just been released in its electronic edition here https://www.smashwords.com/books/view/243674 . It's intended for children between the ages of 8 and 12 and includes activities and vocabulary relating to the topic. The Testament of Morann is the advice given to a king on how to rule well. At first glance this piece may seem simple and may also seem like something that doesn't apply to anyone not planning to rule, but in fact much wisdom can be gained from studying this text. The first section discusses the power of reciprocity and the benefits gained from holding to the ideal of Truth. The second section teaches the new king how to judge well and by what measure to judge all things. The final section discusses superior things and the four types of kingship. When taken as a whole these sections help us to see the right order of the world and how to maintain it. It is important to understand why the first section looks at both the power of reciprocity and the power of Truth, because although these two concepts are often viewed as separate, in reality they expressions of one ideal. Reciprocity is the universal balance that is maintained; when we give, we get in return. Truth is the equilibrium of the universe, it is the pivot point on which reciprocity rests. Each one exists as an expression of the other and neither could exist without the other. Within the text this is expressed through lines such as “Let him exalt mercy, it exalth him” which teach us that the characteristics we embody will in turn be drawn to us and “It is through the truth of the ruler that milk-yields of great cattle are maintained.” Which shows us that is through the manifestation of Truth that reciprocity yields positive things for the king's subjects. On a smaller scale this can be found to hold true within the lives of each individual and each Druid; when we speak and live Truth our lives will reflect blessings and we will draw to us the things we embody. The second section focuses on the king’s judgment of all things within his kingdom. At first glance this may seem superfluous to many of us but in fact much wisdom is hidden in these lines, for the king is urged to judge all things by their own produce as we can see from lines like “Let him estimate the earth by its fruits”. This is good advice for anyone, because it urges us to judge anyone or anything only by the end product, surely a method to reach a fair and impartial judgment. If we seek to judge not through emotion nor based on the item or person themselves, but only on the result or product, then we will judge fairly and well. These also contain deep wisdom if studied. The first two lines set up our understanding of the rest of the wisdom we are shown, for indeed darkness yields to light and sorrow to joy by their own nature and just so does a fool yield to a wise man. This is not a statement about the intelligence of men or about the choices people make in different situations, but rather it is a commentary on the natural order of the world and how one condition or person yields to another. This segment then segues into a description of 15 characteristics that the king should have, followed by a list of ten things that “extinguish” the rule of a bad king; when studied closely we can see that these ten are reciprocal benefits of the 15 things listed in the previous line, reinforcing that to exemplify certain characteristics is to draw blessings to our lives. The writer then proclaims that the king “may die” and “will die”, and “may depart” and “will depart” but that what matters is how he rules for that is how he will be remembered. This is important advice for us all to remember, because we will all die one day and it is by our actions during life that we will be judged by those who come after us. And final this last section discusses four types of rulers: the true ruler, the wily ruler, the oppressive ruler, and the bull ruler. We can also look at this in broader terms as describing four types of people in general; the one who lives by truth, the one who lives by doing what is in their own best interest, those who live by force and outside control of others, and those who are in constant conflict with others. The Testament of Morann holds much wisdom for living as a good king, or as a good Druid. It shows us how to live in Truth, judge wisely, to seek the natural order, and describes the four types of rulers. Knowing all of this it is up to us to choose which of the four “types” of people we want to strive to be. If we want to be a person who lives by Truth then this work gives us many of the tools to find that path and master the wisdom needed for it; in the end whether we seek to be a good ruler, a good Druid, or a good person all of these tools will be needed. I've written before about how I approach honoring the ancestors and various Gods, and I have written before about some of my thoughts on the spirits of the Otherworld, but I've never really discussed directly how I percieve those spirits or honor them. Since the Good Neighbors comprise a huge aspect of my own personal practice I feel like I really should discuss it here. Or perhaps I am just feeling brave today, as it is said that one should not discuss one's own personal experiences. 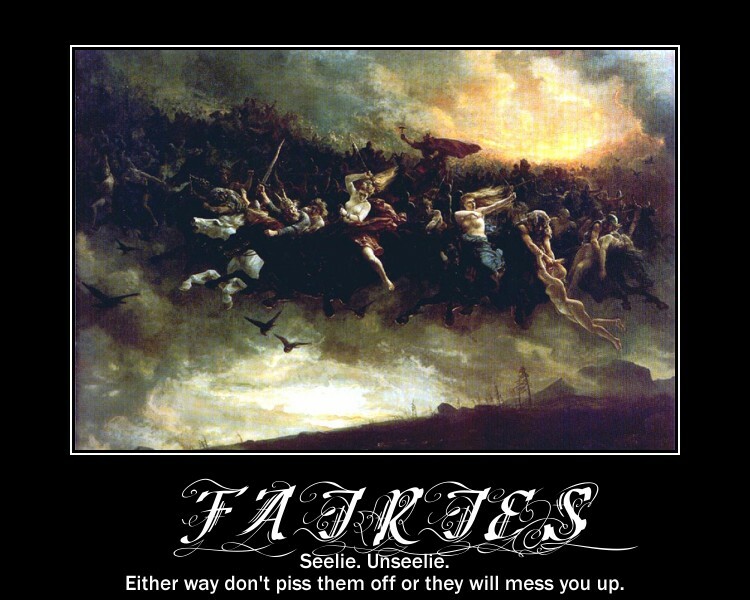 First off I cannot emphasize enough that my view of the Fairies is very different from most other modern pagans, at least in my own experience. I have what I call an "old school" approach to them that is perfectly in line with what you'll find in Irish folklore and writing from 100 years ago by authors like Yeats and Wilde but is generally at odds with the belief in modern paganism. For me the term "fairy" is something of a catch-all that can describe any being that is not a human nor clearly catagorized as a deity, angel, or the like. Fairies can be or appear as animals or as giants, as tiny people or as very human seeming. Fairy beings often seem mercurial to humans because they operate on an entirely different culture and ettiquette system than we do. They can be cruel and vicious, or generous and kind. Some of them are helpful. Some are indifferent. And some of them think we make a very tasty meal indeed. And all of them take being insulted or disrespected very badly. Sarah: I thought they did nice things, like... like granting wishes. Hoggle: Shows what you know, don't it? Pretty much like that. Except sometimes much more frightening. It always surprises me that people want to have close dealings with fairies, as its a risky thing at best for most and if you study the Celtic Fairy Faith it becomes clear that most of the honoring was done to avoid mischief or as appeasement, not to draw them in. In fact many people avoid saying the word fairy or naming a specific type of fairy for fear of drawing their attention; instead a nickname is used that invokes a pleasant image, such as Mother's Blessing or the Gentry. Fairies can cause madness, can torment a person or animal, and can cause seemingly invisible injuries, called elfshot, which might manifest as sudden unexplainable pain or cramping in a leg or arm. Strokes were once even thought to be the result of elfshot. Why would anyone choose to offer to them or deal with them? Well on the one hand some of them are capable of doing great harm and its not a bad idea to be on their good side to avoid that, when possible. On the other they can bless a person with great luck or fortune, or even (as in the cases of the old Fairy Doctors) with knowledge of healing and magic. And for most pagans and magic workers its probably a good idea to have some knowledge of the Fey and to be respectful, to maintain good relations as it were. Me personally? I have been aware of them for so long that they are simply another part of my life, thanks to what the Irish call the second sight. I also have what can best be described as an ancestral connection in that area that shapes how I approach the subject. By the time I was old enough to start reading the written material that's out there like the Fairy Faith in Celtic Countries or Yeat's Celtic Twilight I found that it was only reflecting my own experiences, and that became not only my measuring stick to judge other books by but also a guide as I grew older on how to behave properly towards them. And yes I have had real world experiences, some good and some not so much. I've been pixie-led, I've seen fairy hounds both black as night and shining white, I've encountered land spirits of various sorts, and more. For me honoring and interacting with the Fey is done as much out of inevitability as choice, but I can honestly say that it's never been boring. So who, exactly do I offer to and how do I see them? The Good Neighbors (the Gentry, the Fair Folk) look much like Tolkein's elves but without the pointed ears and seem to be a kind of cousin of the Norse alfar. Some of them take an interest in a person or family and will offer help and guidance, even when the person doesn't listen or goes against the helpful advice. With the Fair Folk either they like you or they do not, there is no real influencing it, although they can certainly be angered by anyone. Land spirits often take the form of an animal and sometimes of a person, but seem more primal in their nature than the Fair Folk with their structured culture. In my experience land spirits have amore territorial feeling to them which immediately sets them apart from other types of fairies, and they seem to prefer more natural offerings. And of course there are also house spirits that can be offered to, and who may appear in diverse forms, usually smaller, and can effect the luck of a home. Now that I have explained my perspective on Otherworldly beings in general and the Good Neighbors, land spirits and house spirits in specific, on to how I honor them. I have two places I leave offerings, a hawthorn tree in my yard that has been made into a kind of clootie tree and an indoor altar created expressly for the purpose of honoring the aos sidhe, et al., Indoors I will light candles and offer food; they seem to like candy and baked goods, although for the Good Neighbors I sometimes offer jewelry. They also all seem to like milk, cream, and alcohol, with milk and cream being traditional offerings. Outside I will leave baked goods like bread or cakes, and will tie things into the branches of the tree as offerings, such as bells. I make at least one offering each week on a certain day, and additional ones on holy days and special occassions. I also do my best to remember to pay attention and listen, and I have recieved many useful messages this way; additionally of course I interact with them during spiritual journeys when I am traveling out into their space, so to speak. I follow the belief that we should not say "thank you" to any being of Faery as it is dismissive and they don't seem to appreciate it, so when I call them in ritual, which I do, I always end by saying "May there be peace and friendship between us." I always make some sort of offering. And I always do my best to follow the various geasa associated with working with the daoine sidhe and the personal ones I have accumulated. I could not fairly say that I am closer to the daoine sidhe than the ancestors or Gods, but I can say that while the others wax and wane in interest and attention the Otherworldly spirits are a constant for me. There is probably some irony in that somewhere.